The Liquid LiHa is offered with disposable or fixed tips. Fast wash pumps ensure total system cleanliness through rapid washing of fixed tips from behind to minimize sample carry-over. All LiHa arms offer variable Y-spacing, enabling sample transfers to and from a variety of labware types. Long, thin, fixed steel tips provide reliable septa piercing and can reach the bottom of nearly all labware, ideal for example when working with cell culture vessels. Each liquid-filled, positive displacement channel offers efficient transfers, detecting and tracking the liquid level to avoid over-submergence of the tip or disturbance of sample pellets or precipitates. Up to 16 XP Smart dilutors – precision syringe pumps ranging from 50 to 5,000 µl – ensure a perfect match between tip volume and dynamic range, with mixed channel configurations available to fit your workflow needs. Generate positive pressure for fully automated chromatography and protein purification eg. for OPUS® RoboColumns®. A Liquid LiHa is pipetting from a tube to another tube with 5ml disposable Tecan tips. 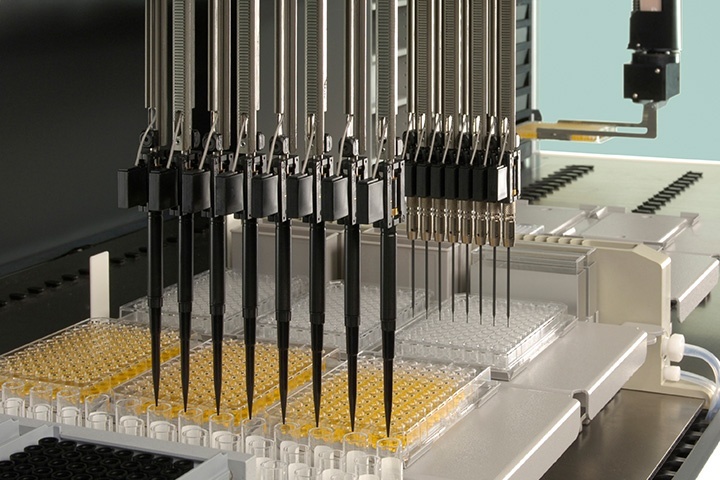 A Liquid LiHa is perfoming a multipipetting step from a trough to a 96 well plate with disposable Tecan tips. A Liquid LiHa with washable fixed tips perfoming a wash cycle in the washstation. Watch the fascinating moves of a Liquid LiHa with fixed tips or disposable tip adapters in all possible directions. The Liquid LiHa automatically detects a missing disposable tip and corrects the error. The Wine Microbiology and Microbial Biotechnology Laboratory at the University of Adelaide has developed a customized solution offering fully automated sampling for yeast fermentations. Based on a Freedom EVO® 200 platform, this system frees researchers from the need to manually aliquot samples day and night for up to three weeks. UCL’s Advanced Centre for Biochemical Engineering is harnessing the flexible automation capabilities of its Freedom EVO® workstations to explore novel bioprocessing applications, with a focus on the production of ‘next generation’ medicines including protein-derived therapeutics, vaccines and cells for therapy. Combining the Freedom EVO platform with devices such as Atoll’s MediaScout® RoboColumns®, researchers are able to generate high quality, scalable data that minimizes the cost and time required to optimize new bench-scale processes.